Two brothers are celebrating as the first spirit at their new micro distillery in Dornoch began to flow this month. Phil and Simon Thompson's dream of opening their own distillery has become a reality as the Dornoch Distillery opened for business producing hand distilled gin, vodka, rum and whisky. The £250,000 development has been funded by Phil and Simon, a crowd funding campaign that attracted £200,000 and investment of £34,000 from Highlands and Islands Enterprise (HIE). Three new jobs are expected to be created. HIE has also assisted with a Go Global grant towards an international sales and marketing mission to Japan and guidance on the distillery's production layout, systems and processes was provided through the Scottish Manufacturing Advisory Service. Distilling equipment including a mash tun, copper still and washbacks has been recently installed at premises occupying the Old Fire Station in the grounds of the Dornoch Castle Hotel - a family run concern. Up to 50,000 litres of alcohol per year will be distilled. 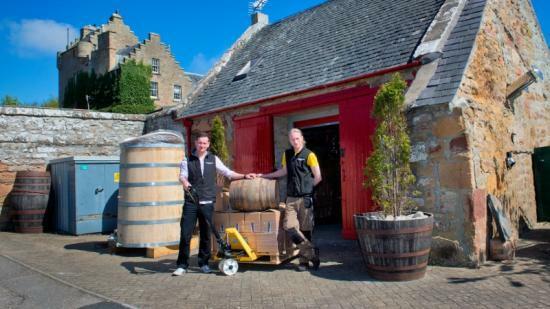 Sales director Phil Thompson said: "Realising our ambition of opening up our own distillery has been incredible. It's been hard work and we are grateful to many people who have encouraged us along the way, investing their time and money to get us to this stage." Phil and Simon are renowned in the whisky world having built up a wide international following online and by running the whisky bar at the Dornoch Castle Hotel. Simon Thompson who oversees product distilling, flavouring and technical aspects at the distillery said: "Our passion for championing old style whisky while developing new flavours and experiences to cater for modern tastes has made it all worthwhile. "The next step is to establish ready markets at home and internationally for our gin, vodka and rum. Sales of these will enable us to successfully trade until our whisky can be bottled after a minimum of three years." HIE supports food and drink businesses to realise their growth ambitions and the project will contribute towards the Dornoch Master Plan that was originally commissioned by HIE. Account Manager at HIE, Laura Gunn said: "This exciting new distillery adds to the rich variety and high quality food and drink offering found throughout the area. "Research indicates the premium white spirit market is growing and there is increased consumer interest in craft distilleries that use local ingredients and promote product provenance."